Objective The Fluids in Shock (FiSh) Trial proposes to evaluate whether restrictive fluid bolus therapy (10 mL/kg) is more beneficial than current recommended practice (20 mL/kg) in the resuscitation of children with septic shock in the UK. This qualitative feasibility study aimed to explore acceptability of the FiSh Trial, including research without prior consent (RWPC), potential barriers to recruitment and participant information for a pilot trial. Design Qualitative interview study involving parents of children who had presented to a UK emergency department or been admitted to a paediatric intensive care unit with severe infection in the previous 3 years. Participants Twenty-one parents (seven bereaved) were interviewed 16 (median) months since their child’s hospital admission (range: 1–41). Results All parents said they would have provided consent for the use of their child’s data in the FiSh Trial. The majority were unfamiliar with RWPC, yet supported its use. Parents were initially concerned about the change from currently recommended treatment, yet were reassured by explanations of the current evidence base, fluid bolus therapy and monitoring procedures. Parents made recommendations about the timing of the research discussion and content of participant information. Bereaved parents stated that recruiters should not discuss research immediately after a child’s death, but supported a personalised postal ‘opt-out’ approach to consent. Conclusions Findings show that parents whose child has experienced severe infection supported the proposed FiSh Trial, including the use of RWPC. Parents’ views informed the development of the pilot trial protocol and site staff training. Research is needed to determine whether restrictive fluid bolus therapy is more beneficial than current recommended practice in the resuscitation of children with presumed septic shock. Paediatric emergency and critical care trials encounter practical and ethical difficulties, as there is no time to seek informed consent in an emergency situation. Feasibility work incorporating patient perspectives can help test key parameters and ensure the trial is appropriate to the needs of patients and their families. Our findings support the proposed Fluids in Shock (FiSh) pilot trial and demonstrate the value of using qualitative methods to involve parents in the design of trials. Tailored verbal information can help address parents’ priorities, concerns and misconceptions about FiSh. This study provides new insight into what should happen if a child dies after being entered into a trial without prior informed consent. Rapid fluid replacement by bolus is integral to the management of children presenting to UK emergency departments (EDs) with septic shock. Current UK guidance, recommending fluid boluses of 20 mL/kg,21 is based on weak evidence.22–24 The Fluid Expansion as Supportive Therapy (FEAST) trial25 compared fluid bolus resuscitation of 20–40 mL/kg with no bolus maintenance fluid in over 3000 African children with severe infection and reported 30% higher mortality with fluid bolus resuscitation.25 This raised uncertainty and highlighted the lack of evidence for fluid bolus resuscitation for children in middle-income and high-income settings. Accordingly, the Fluids in Shock (FiSh) randomised controlled trial (RCT) was designed to determine whether restrictive fluid bolus therapy (10 mL/kg) is more beneficial than current UK recommended practice (20 mL/kg). Prior to conducting the definitive RCT, the need for qualitative feasibility and clinical pilot work was identified to explore key challenges, including insufficient time to obtain informed consent and delivery of a fluid bolus protocol, which deviates from current recommended practice. This paper presents findings from the qualitative feasibility study, which aimed to review and explore with parents the acceptability of the FiSh Trial, approach to consent, potential barriers to recruitment and participant information materials for the pilot trial. We conducted semistructured telephone interviews with bereaved and non-bereaved parents of children who had presented to a UK ED or been admitted to a paediatric intensive care unit (PICU) with severe infection in the previous 3 years. Severe infection was defined as any condition leading to treatment for sepsis or septic shock, for example, meningococcal septicaemia. Parents were excluded if they did not speak English. We used previous research1 12 26 to develop an interview topic guide (see online supplementary file 1 table 1) and draft Participant Information Sheet (PIS) for the pilot trial (see online supplementary file 2). The topic guide contained open-ended questions and prompts to help explore parents’ views on the acceptability of the FiSh Trial, including the pilot trial PIS and approach to consent. A separate section of questions was developed for bereaved parents. Based on previous studies,1 we anticipated recruiting 15–25 parents. We used three recruitment routes (figure 1). Fluids in Shock qualitative study flow chart. ED, emergency department; PICU, paediatric intensive care unit. Clinicians used hospital medical records to identify the 15 most recent parents (including up to five bereaved) of children who met the inclusion criteria. Those identified were sent a postal invitation, including a covering letter and qualitative study PIS that detailed how to register interest in taking part. A participant information poster and copies of the qualitative study PIS were placed in PICU family rooms in hospitals. We posted an advert on Twitter and Facebook and asked relevant charities and parent support groups to place the advert on their website and social media. CBO and KW responded to parents’ requests to participate in sequential order, confirmed eligibility and emailed them the pilot trial PIS. Audio-recorded verbal consent was sought before the interview began. Digital audio recordings were transcribed verbatim, anonymised and checked for accuracy. Respondent validation was used to add unanticipated topics to the topic guide as interviewing and analysis progressed.27 Interviews aimed for data saturation, that is, the point where no new major themes are discovered in analysis.28 29 Screening stopped when data saturation28 29 was reached. All participants received a £30 shopping voucher and letter thanking them for their time. CBO (a psychologist) led the analysis with assistance from KW (a sociologist). Analysis was broadly interpretive and iterative30 31 (see online supplementary file 3 table 2). Informed by the constant comparative approach, the aim was to provide accurate representation of parental views on trial design and acceptability.32–35 We used NVivo V.10 software to assist in the organisation and coding of data. Four UK hospitals took part in recruitment routes 1 and 2, and 11 charities/support groups in recruitment route 3. A total of 58 parents registered interest, of whom 29 were screened (figure 2); three were deemed ineligible and five did not confirm a date for interview. Data saturation28 29 was reached when 21 parents were interviewed (18 mothers (5 bereaved), 3 fathers (2 bereaved)). 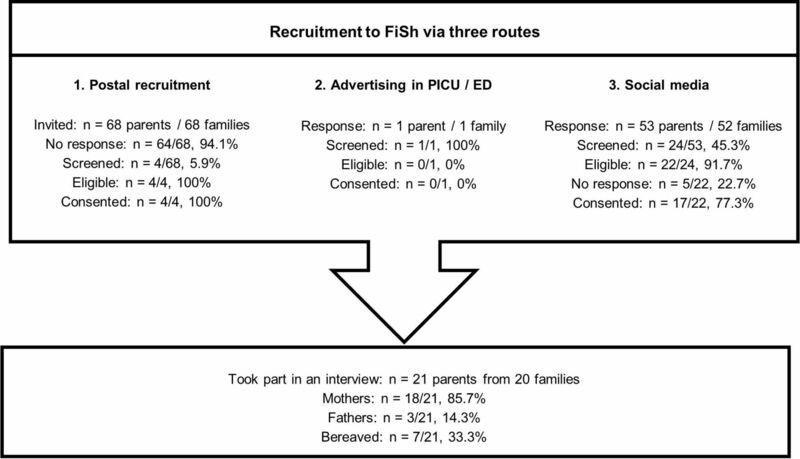 FiSh qualitative study parent recruitment process. For families identified using social media, responses were dealt with in the order they were received, screened, then interviewed where eligible. Data saturation was reached without the need to screen the remaining responses. ED, emergency department; FiSh, Fluids in Shock; PICU, paediatric intensive care unit. Bereaved parents were interviewed on average 11 (median) months since admission (range: 3–31) and non-bereaved parents on average 16.5 months since admission (range: 1–41). The median hospital length of stay for their child was 1 day (range: 1–25) for bereaved parents and 14 days (range: 4–140) for non-bereaved parents. Eight parents had previously participated in a clinical trial. One mother had experience of RWPC. Interviews took between 30 and 55 min (see online supplementary file 4 table 3 for selected quotations from parents by theme). A general definition of RWPC was first read to parents (box 1). Many described how they may be initially surprised to discover that their child had been entered into a trial without their prior consent. However, concerns subsided once reasons for using RWPC in emergency situations were considered. Parents went on to respond favourably to RWPC, describing it as a logical solution to enable research in challenging circumstances. Due to the need to treat a patient in an emergency without delay, or because parents may not always be present when a child needs treatment, it is not always appropriate or possible to obtain consent before a child is entered into a trial. To enable research to be conducted in the emergency setting, many countries (including the UK) allow consent to be sought as soon as possible afterwards. This is for permission to use the data already collected and to continue in the trial. This is research without prior consent (sometimes called deferred consent). Research without prior consent is a relatively new approach to seeking consent in the UK. Overall, parents spoke of their support for FiSh and its use of RWPC. Many viewed trial participation as a way to help other families and children in the future. Some parents thought that a recruitment discussion could provide a “distraction” (P9, mother, non-bereaved) and foster “a sense of control in a situation where you feel completely out of control” (P6, mother, non-bereaved). However, support for the FiSh Trial appeared to be dependent on the intervention being successful and “how well [their child] was” (P4, mother, non-bereaved). Parents, including those who were bereaved, said they would question whether their child’s participation in the trial was “the reason [their child] didn’t survive” (P19, mother, bereaved), in that eventuality. Some parents held specific concerns and misconceptions, which influenced their views on the acceptability of the FiSh Trial. Many were concerned that a change from current practice may jeopardise their child’s chances of survival. This was linked to the misconception that routinely used treatments are proven to be effective. Parents were also concerned that restrictive fluid bolus therapy would be insufficient as a liberal approach to fluid bolus resuscitation was viewed as being more likely to save a child’s life. In response, CBO directed parents to sections of the pilot trial PIS and provided tailored explanations, such as the weak evidence base for current recommended practice, how fluid resuscitation is part of a larger treatment package and monitoring procedures. Such tailored explanations appeared to address parents’ initial concerns and misconceptions about the proposed FiSh Trial. All parents described the pilot trial PIS as being clear and concise. However, parents raised questions about aspects of FiSh (box 2), indicating that key information was unclear or missing. Importantly, this information was prioritised by parents, impacting on their understanding and views about the acceptability of the trial. Many said they would not ask questions or raise concerns with a FiSh recruiter. Would the amount of fluid given be corrected if my child was not stabilising? Does the amount of fluid have a direct impact on outcome? What is a fluid bolus? What is the timing of fluid bolus administrations? Will I be able to find out which group my child was randomised to? Does the fluid treatment apply regardless of the child’s age? Parents described how a FiSh Trial discussion should happen after the initial stress had subsided and their child’s condition had stabilised, preferably within 24–48 hours. Parents expressed the need for recruiters to gauge appropriate timing of this discussion in consultation with the clinical team. We asked bereaved parents to consider a scenario in which their child had been entered into FiSh before death and a practitioner approached them after death to discuss the trial. They suggested that FiSh recruiters should be prepared to address concerns about whether trial participation was “a reason as to why [death] happened” (P21, mother, bereaved). They emphasised a need for sensitivity and time, particularly if their child had died very quickly, without warning. Parents described their anger in the initial stages of bereavement, which they believed would negatively impact on decision-making abilities and their response to a FiSh Trial discussion. Nevertheless, all bereaved parents agreed it would be acceptable to discuss FiSh at a later time, after they had left hospital. Bereaved parents valued medical research and described how they would have consented to the use of their child’s data as a way to help other children in the future. We then sought bereaved parents’ views on the most appropriate way of contacting parents to discuss FiSh following death of a child (box 3). Several parents thought an appropriately timed face-to-face discussion with a nurse or consultant would be preferable to a telephone call or letter. The majority however supported contact via post at 4 weeks and then at 8 weeks after death as long as the ‘opt-out’ approach provided was emphasised in bold and the letter personalised, ideally by a known member of the clinical team. However, parents described grief as a “very personal matter” (P17, mother, bereaved), making it difficult to develop general recommendations on how best to approach parents in this situation. Our findings provide new insight into what should happen if a child dies after being entered into a trial.36 Although some bereaved parents preferred a face-to-face research discussion, the majority responded favourably to being contacted via a letter, providing the opportunity to meet with a practitioner at a later date. Bereaved parents responded favourably to the inclusion of their child’s data in the trial unless the family notify the research team, provided this ‘opt-out’ approach is emphasised in bold text within the letter. Importantly, parents recommended that the letter should be sent from a practitioner known to the family with whom they had developed a close and trusting rapport.36 As septic shock is associated with an 8%–17% mortality rate,23 46 these findings are particularly important and will help design a trial that is appropriate to the needs of vulnerable families. The views of bereaved parents also highlight the need for practitioners to prepare to respond to parents who are concerned that trial participation may have resulted in harm. While our sample size was relatively small, data saturation was reached35 and both bereaved and non-bereaved parents were included. 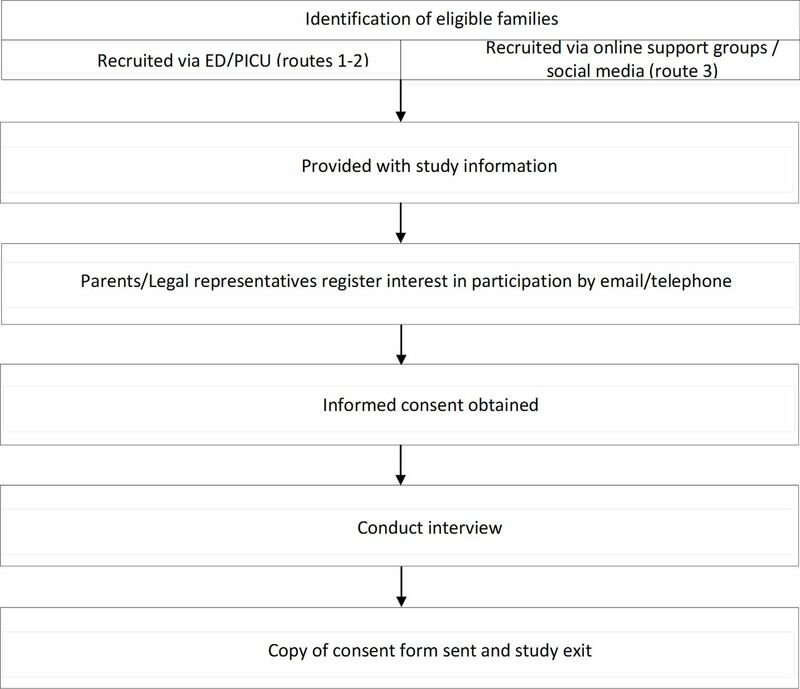 As the majority of parents were recruited using social media, our sample may comprise parents with an interest in research and may not reflect the potential FiSh sample. Although all parents had experience of paediatric emergency and critical care, the majority had no previous experience of RWPC. Additional qualitative research will therefore be conducted within the FiSh pilot trial to further explore parental acceptability of the FiSh Trial, approach to consent and practitioner training needs. Finally, children were not involved in this study. Research is required to explore children’s views on RWPC in emergency and critical care trials. Overall, findings suggest that parents whose child has experienced severe infection support the proposed FiSh Trial, including the use of RWPC. Parents’ views have informed the development of the pilot trial protocol and site initiation training. The authors thank all the parents who shared their experiences with us; their contribution to the research is invaluable. The authors are grateful to all the staff at participating UK hospitals and charities/support groups for their help with recruitment. The authors would also like to thank the Paediatric Emergency Research in the UK and Ireland (PERUKI) and Paediatric Intensive Care Society (PICS) for their support and contribution to the development of this research. Council of the European Union. Proposal for a Regulation of the European Parliament and of the Council on Clinical trials on medicinal products for human use, and repealing Directive 2001/20/EC. Brussels: Council of the European Union, 2013. Legislation.gov.uk. The Medicines for human use (Clinical trials) and Blood Safety and Quality (Amendment) Regulations. 2008. Department of Health. Medicines for human use Regulations 2004. London: UK Government, 2004.
. Children and young people’s views on research without prior consent in life threatening situations: a qualitative study. Arch Dis Child 2017;102:A108. NICE. Sepsis: recognition, diagnosis and early management. London: National Institute for Health and Clinical Excellence, 2016.
. Assessing quality in qualitative research. BMJ 2000;320:50–2.
. How many qualitative interviews is enough? National Centre for Research Methods (NCRM); University of Southampton, 2012.
. How many interviews are enough? an experiment with data saturation and variability. Field Methods 2006;18:59–82.
. Basics of qualitative research: techniques and procedures for developing grounded thoery. 2nd edn. CA: Thousand Oaks, Sage, 1998.
. Research without prior consent (deferred consent) in trials investigating the emergency treatment of critically ill children: connect study guidance. Univeristy of Liverpool, 2015. PICANet. Paediatric Intensive Care Audit Network (PICANet) Annual Report. UK Universities of Leeds and Leicester, 2013. Contributors KW, DI, PRM, MDL, SN, MJP, DAH, AC, NJ and KMR conceived and designed the research. CBO, KW, DI, AC, NJ, RRC, PRM and KMR contributed to the design of recruitment materials and topic guide. CBO conducted the interviews. CBO and KW analysed the data. CBO, KW and DI wrote the paper. MDL, RRC, MJP and PRM critically revised the manuscript. All authors reviewed and approved the final manuscript. Funding This study was funded by the National Institute for Health Research (NIHR) – Health Technology Assessment (HTA) Programme (Project: 13/04/105). The views and opinions expressed therein are those of the authors and do not necessarily reflect those of the HTA, NIHR, NHS or the Department of Health. The researchers are independent from the funders. The funders had no role in the collection, analysis and interpretation of data; in the writing of the report; and in the decision to submit the article for publication. All authors had full access to all of the data in the study and can take responsibility for the integrity of the data and the accuracy of the data analysis. Ethics approval North West – Liverpool Central Research Ethics Committee (15/NW/0913).